It’s been an exciting week for me! On Monday, we finally took the wraps off the product that I’ve been working on since leaving Microsoft 18 months ago. We’re trying to make R a better language by giving it a better IDE. It’s called RStudio. It’s free as in beer, and free as in speech. You can download it today, or even peruse the source. 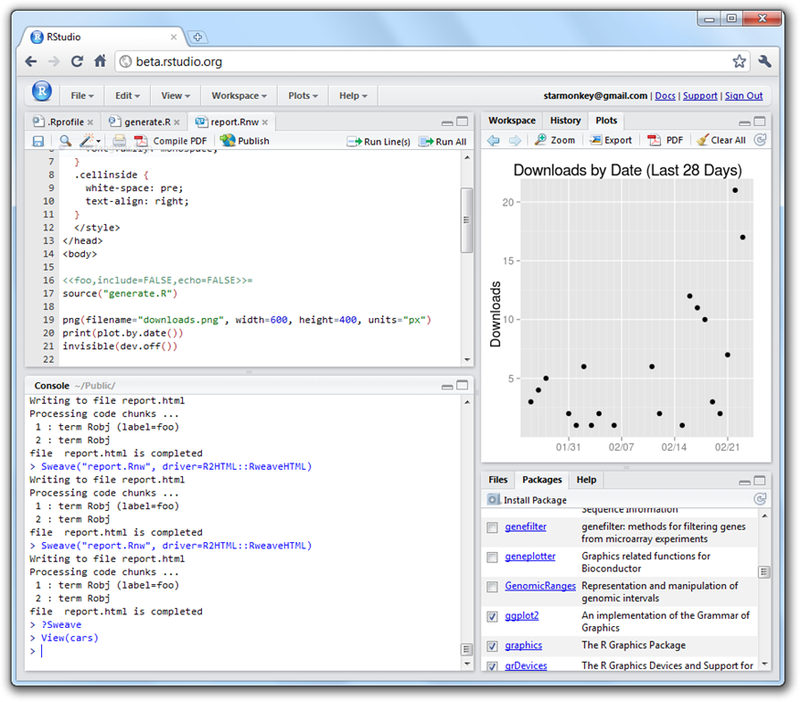 We designed RStudio from the ground up to make working with R easier and more productive. It brings your R console, source code, plots, help, history, and workspace browser into one cohesive package. We’ve added some neat productivity features like a searchable endless command history, function/symbol completion, data import dialog with preview, one-click Sweave compile, and more. Many experienced R users have told us that even at this early stage, RStudio is the R IDE that works best for them. What’s really unique about RStudio, though, is that it can run equally well as a desktop program or as a web application. What does it mean to run an IDE as a web application? Take a look: Here’s a screenshot of RStudio running in Google Chrome on Windows 7. As you can see, it’s a full IDE—it just happens to be in a browser. The server I’m using is an 8-proc Ubuntu server with 68.4GB of RAM (it happens to be on EC2). When you run RStudio this way, it’s always the server’s computing resources—CPU, RAM, hard drive—that are being used by R.
Why is this interesting? It turns out that a lot of serious R users share a big, powerful Linux box or cluster with their colleagues. They write their R code on their own desktop or laptop, and execute it on the big server. There’s definitely a lot of friction in this workflow. With RStudio, a lot of the friction goes away because you can do your exploring and iterating directly on the big iron. If you’re an R user, try it out and let us know what you think! Absolutely amazing. I tried to develop something similar to this, athough with a focus on a menu driven system over the web. rnorm(1000) and it displays the 1000 random numbers almost instantaneously. Plots load as if the file is local. How are you guys able to make the web version so quick? Thanks! Nothing special really–the console requests/responses are just JSON being passed back and forth with XHR, and for the plots we just render .png files on the server and pass them down. This is very interesting. I got same idea to make it available on iPad but GPL is the issue. Your website is a better sense! Genius! Just genius! THANK YOU! This is very awesome, but you have to have Linux server to run over the web Rstudio?? I am a student, and I use Windows. I have a Mac, too. And that is still not sufficient to run Rstudio over the web? Thanks for the post, you are one of the few people who addressed this. @colstat: That’s correct, you currently need to use a Linux server to host the server edition of RStudio–it can’t be hosted on Windows or Mac. However the Linux server can be a virtual machine (either on your Windows or Mac machine, or in the cloud on Amazon EC2 for example). I would like to give linux a try. How should I set that up, I already have vmware, is it something similar to that? Do I actually need a server? Yes, you can use VMWare. Just install, say, any recent version of Ubuntu into a VMWare virtual machine (it can be desktop or server install, doesn’t matter); then install R (http://cran.at.r-project.org/bin/linux/ubuntu/); then install RStudio Server edition. You should be able to fire up a web browser in the Linux VM and point it to http://localhost:8787/ and see RStudio. If that works, then you just need to configure VMWare to make the VM visible on the network. Hopefully you can figure that last part out from VMWare’s documentation/help. @Joe, VMware allows up to build virtual apps. It would be great if you can have a RStudio Server app. which i can just install and it runs out of the box. A Virtual apps with ubuntu and rstudio server installed and configured and fully working right of the box. you mentioned on Y-Combinator that you will be posting how RStudio was created in detail. I’m still waiting for that article. On mac it looks very nice but not native. Is there any plan of adding native mac widgets. for e.g. native tab widgets.